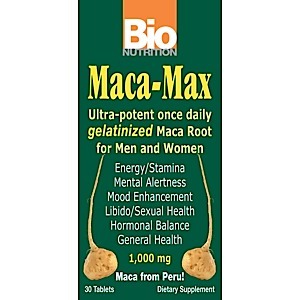 Bio Nutritions Maca-Max is an ultra-potent form of gelatinized Maca Root in a once daily 1,000 mg tablet. Gelatinized Maca has undergone a comprehensive purification process removing unwanted pathogens, toxins and starches that are found in standard Maca products. Gelatinized Maca is up to 90% more absorbable then non gelatinized Maca Root. Take one (1) tablet daily preferable with the first meal of the day or as recommended by your health care professional.